I read a research paper over the holidays about the healing and health cycles, and their metabolic stages in chronic disease conditions. It was incredibly heavy on the biochemistry, asking me to focus and dig back into my memory bank to follow along, as if the authors were on their own language planet that most of us can’t understand (they are) and that they were trying to prove something with their language use (also likely). But at other times, the message was incredibly clear: Sleep is medicine. Exercise is medicine. A varied, seasonally-appropriate diet sourced largely from the local ecosystem, and lots of cruciferous vegetables like broccoli, kale and brussels sprouts, which are rich in compounds that produce a long-term increase in antioxidant activity, are medicine (1). In the end, the article gave me lots to think about in terms of future breakthroughs in healing chronic health conditions, but it also reminded me that sometimes the simplest measures work the best. Like adequate rest and restorative sleep, movement that’s enjoyable, and comforting food that’s also nutritious and seasonal. This recipe is my answer to that. It’s the morning meal I’ve been enjoying often the last few weeks. Creamy, slightly sweet, with a little spice. I make my own golden spice blend, based off of Sara Britton’s, but it seems that a good pumpkin or apple pie blend with turmeric will also do the trick. Bring the water to a boil in a small pot. Then turn down, add the oats and spices, as well as the chopped pear. Cook until creamy and nearly done, about 5 minutes. Then stir in the tahini and salt. Dish into one or two bowls and add sweetener of choice, if needed. This will largely depend on personal preference and the ripeness of the pear. For this, you’ll need a spice or coffee grinder or starting with a complete list of ground spices. To make a big batch measure parts using either weight in grams or in teaspoons. First add the spices that are whole (such as coriander seeds or star anise) to a spice grinder. Blend until as fine as they will get. 1) Naviaus, R.K. (2018). Metabolic features and regulation of the healing cycle–A new model for chronic disease pathogenesis and treatment. If you’ve been doing the seasonal thing lately, this month has already brought an onslaught of cookies and holiday treats to be baked, eaten, and shared. Making cookies is my favorite December tradition but I definitely prefer making to eating them. This is because inevitably after eating cookies and all the other traditional baked goods, I feel bogged down, lethargic, and mentally all over the place. This is often true even despite my bent towards making goodies that are leaning towards healthier over traditional. Late in the summer, I decided to buy myself a new cookbook for the year and I chose the one I had been eyeing for quite some time, Kate O’Donnell’s Everyday Ayurveda Cooking for a Calm, Clear Mind. The first 100 or so pages are actually about ayurveda and the energies in the body that contribute to wellbeing, as well as everyday practices for living a balanced, sattvic lifestyle. Even before getting to the recipes, this information is an approachable guide to how to truly promote one’s health. There are also a ton of recipes of course, but what I’ve made again and again, both following the recipe and deviating sharply, are the No Donut Holes. Despite making and eating them nearly weekly for months, this after dinner treat has never once left me in cookieland feeling less than thriving. 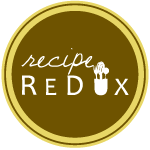 In annual tradition, The Recipe Redux challenge for December is a recipe remake from a cookbook, and so naturally I decided to put a festive spin on those no donut holes with a molasses and gingerbread infusion–flavors I love this time of year. When it comes to molasses, there are several different types. I grew up with Brer Rabbit Full-Flavored, which is the second boiling formed as a by-product when sugar is processed. Molasses from the first boiling is the lightest and sweetest, often called mild molasses. Beyond these two, the third boiling results in blackstrap molasses, which is the darkest, least sweet, and most mineral rich type. It is the type I favor now. Blackstrap is a great source of dietary iron and sometimes recommended as a food source iron supplement (1) since one tablespoon can contain as much as 20% of a woman’s daily needs. Additionally, it contains considerable amounts of manganese, magnesium, potassium, vitamin B6, selenium, copper, and calcium. Even though it is still a sugar and should be treated as such, there is actually evidence that adding molasses to carbohydrate-rich meals results in a lower blood sugar rise compared to the meal without molasses (2). When purchasing, look for unsulfured and pure full-flavored or blackstrap molasses. Sulfur dioxide is sometimes added as a preservative and can make the taste bitter, and some companies dilute their bottles down with corn syrup. Before I get to the recipe, Kate says on the no-donut page: Pastries are an instigator of tamas in the mind. [Tamas is heavy, slow, sleepy, stubborn, and unmotivated and can lead to sadness, pessimism, low self-esteem, hopelessness and fear.] The combination of white flour, white sugar, and butter or questionable oils makes a trifecta of heavy, indigestible qualities that gunk up the gut. For most, a daily habit of eating pastries is a ticket to slow, dull qualities. Now, I have nothing against the occasional full blown refined-everything treat, especially this time of year. But I’m also simply glad to add these as an option to the holiday cookie tray. Though I use blackstrap molasses, regular ‘full-flavor’ molasses works great too. Additionally, finely ground oatmeal or oat bran are great alternatives to the oat flour. These can also be made as squares instead of bonbons. Simply press into a square container and chill for about an hour before cutting. In a large mixing bowl, combine the cashew butter, molasses, maple syrup, and vanilla. Add the almond meal, oat flour, and spices and mix until it all comes evenly together. Put the bowl in the freezer for about 5 minutes to firm up. Roll heaping tablespoons of the dough into balls, and then place them on a plate or in a storage container. Store in the fridge for up to 1 week, or in the freezer for longer term. Allow them to come to room temperature before enjoying. 1) Jain, R. and Venkatasubramanian, P. (2017). Sugarcane Molasses – A potential dietary supplement in the management of iron deficiency anemia. 2) Ellis, T.P., Wright, A.G., Clifton, P.M., and Ilag, L.L. (2016). Postprandial insulin and glucose levels are reduced in healthy subjects when a standardised breakfast meal is supplemented with a filtered sugarcane molasses concentrate.